Little is known about Mankar's life before 3E 433, but he fathered two children, Raven and Ruma Camoran, who would both become leading members of the Mythic Dawn. He also wrote the Commentaries on the Mysterium Xarxes, and using the Mysterium Xarxes, given to him by Mehrunes Dagon, he opened a portal to a place known as Gaiar Alata, or 'Paradise', within the plane of Oblivion, which served as the center of his cult. 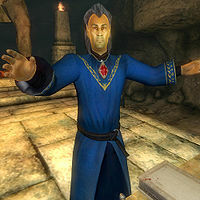 He rewarded his followers by granting them eternal life within Gaiar Alata, though their existence there was less than heavenly, as they were often tormented by daedra. Mankar believed the Nine Divines to be traitors to Lorkhan, whom he believed was a Daedric Prince whose plane of Oblivion was Dawn's Beauty: Tamriel. The assassination of the Emperor was intended to break the covenant which protected Nirn from Oblivion and launch a Daedric invasion by Mehrunes Dagon into Tamriel. While Mankar managed to gain possession of the Amulet of Kings, he ultimately failed to dispose of the last remaining heir, Martin Septim. While Mankar waited in Gaiar Alata for the barriers between Nirn and Oblivion to dissolve, he was hunted down by the Champion of Cyrodiil and slain.